I've noticed two broadly used & accepted methods of quantitative customer success measurement in SaaS: laddering and scoring. A comparison is interesting. 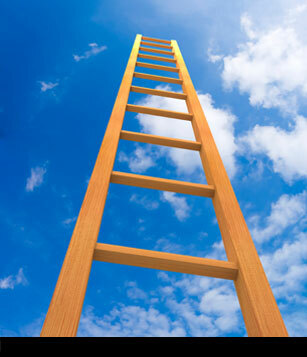 Ladder method: customer success is envisioned as a path, with certain steps necessarily preceeding others. A ladder measuring methodology would look like Feature A > Feature B > Feature C > Feature D, where customers who are on Feature D have completed A, B, and C.
Each further rung in the ladder represents improved level of success and adoption, and a user cannot "move rungs" without completing all the prerequisites. It's a tightly ordered system. Scoring method: customer success is measured as a score comprised of individual feature usage calculations. A scoring methodology assigns point values to features depending on each feature's usefulness to customer success and retention; Feature A is worth 10 points, Feature B is worth 20, Feature C is worth 5, etc., and more points indicates a "stickier" feature more likely to lead to customer success. A user's feature usage is calculated across a variety of quantified features, and a higher score is indicative of higher levels of customer success & better future usage metrics. Scores don't presuppose necessary features, usually, but may give bonuses for combinations or have other more sophisticated mechanisms for weighing user actions differently. Which Customer Success Measurement Works Better...and When? Both the ladder and scoring methods have flaws and benefits, depending on the lay of the software landscape. In the ladder method, the measurement methodology presupposes a single path of success for a customer. And in some cases, this is reasonable. One that comes to mind is a video game - the farther along a player gets, the more invested they are, and the more likely they are to continue (probably). We assume that the path is irrelevant (or at least less important) in the scoring method - a sufficient usage of features indicates an invested, happy user. A score is more useful for a broad suite with easy feature discoverability like Microsoft Office. If a user is using more of the product, we assume a happier user. In practice, a scoring methodology can boil down to a breadth of usage measure - more features used typically means a higher score. And a ladder methodology can side toward a depth of usage measure; further engagement with the ladder typically means a deeper usage. Regression to different means, here. Which Method Is "Better" For My Customers and My Busienss? It's complicated. The two methods originate from different philosophies- ordered vs. unordered feature adoption. These in turn favor depth vs. breadth, respectively. Which does your business favor? That's one way to start selecting one measurement method as opposed to another, but isn't the only question you should ask before considering your next steps. It's complicated because it's unreasonable to say a ladder can't measure breadth, and a score can't measure depth. But when you create measurement for software and choose one of these two methods, it's important to know the inherent biases associated with each of these two. And depending on exactly how customer success measurement is used by an organization, there will be surprising consequences that reflect the fundamental values of the company and those values will be imposed on customers through the software and human interactions. So, tread carefully and slowly, and don't be afriad to gut the whole thing every once and a while. PS I'm working on a hybrid model and will post it when it's done....stay tuned!